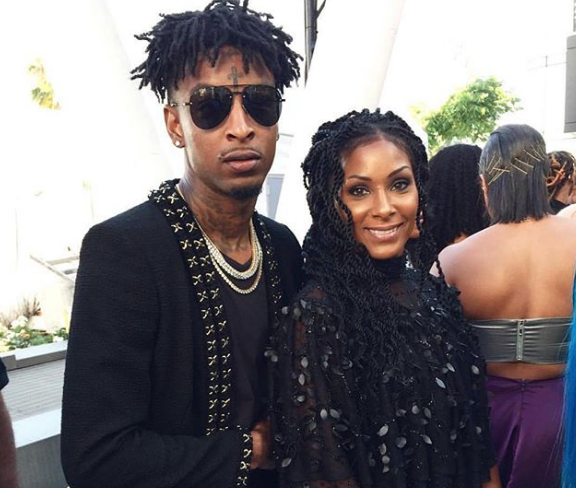 21 Savage’s mom, Heather, is gorgeous. She’s not Haitian, she’s of Dominica descent. The rapper, whose real name is Shayaa Bin Abraham-Joseph, was born in Dominica on October 22, 1992. Heather is a hard worker who doesn’t take any mess. Savage explains that she would get in fights with other children’s mothers when he was younger. 21 Savage comes from a large family. He has six sisters and four brothers. Although his mother worked hard to keep him out of trouble, the rapper was expelled from school, in the 7th grade, for gun possession. Can you blame him? A few years later he was shot six times. Many of 21 Savage’s friends have been murdered. When 21 Savage was 12, a woman that lived in his neighborhood accused him of vandalizing her car. Savage called his mother at work and she came speeding to his rescue. Savage explains that his mother went crazy on the lady. The video below explains that 21 Savage was recently spotted leaving the club with Amber Rose. I don’t think 21 should waste his time with Amber considering her past relationships. From Kanye West to Wiz Khalifa, Amber loves rappers. What do you think about 21 Savage’s mom? Share your thoughts in the comment section below.